The more efficient powder liquid mixing ejector vacuum system. The Vacucam® Ejector Mixer is the most effective system available for conveying, wetting, and dispersing powders into liquids. Here is how it works. 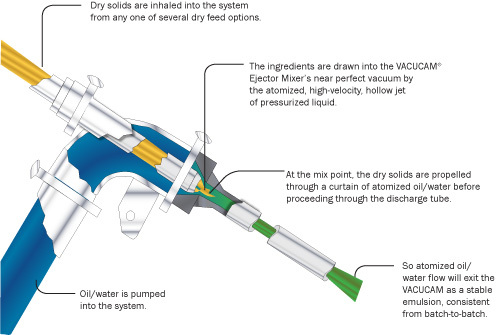 Conditioned powder is conveyed into the mixer by a near-perfect vacuum, which is created when pressurized fluid is discharged as a high-velocity, hollow jet into which the powder is drawn. The high speed dispersion mixer. The Vacucam® system achieves high-speed, instantaneous and complete wetting by bringing together conditioned powder and highly atomized liquid from two separate streams, incorporating particles of liquid with particles of powder. The reactive surface areas of both the powder and the liquid are maximized before intimate contact is actually made. The result is consistently uniform, superior wetting without the agglomeration or “clumping” usually associated with conventional mixing methods. Semi-Bulk Systems can design and integrate the Vacucam® in-line system to feed finished slurry into multiple locations of your preference, such as storage or mix tanks. Your entire process can be physically separated and centrally controlled. Semi-Bulk Systems provides options such as mounting the Ejector-Mixer on your tanks or integrating our system with your existing process. The best fluid ejector upgrade with improved efficiency over the traditional fluid mixer. Since the Vacucam® system achieves high-speed, instantaneous and complete mixing, it makes it perfect for fluid mixing too. You can bring together highly atomized liquids from two separate streams for batch to batch consistency and uniform mixing.